South Indian Bank (साउथ इंडियन बैंक), commonly known as the SIB, is a leading private sector bank in India which is the public undertaking. The bank has it's headquartered at Thrissur, Kerala. The bank has 4 service branches, 850 branches, 48 ext. counters & 20 regional offices across the country. Not only that, all over the country the bank has 1320 ATMs and also has 17 Cash Deposit Machines. The most important thing about the bank is that it is the first bank in Kerala that implemented the core banking system. From the beginning of its journey, the bank pays greater attention to customer services. The prime importance among the customers is the gather updated information about their account information. Keeping the fact in mind, the bank has taken many steps to provide updated data about their account balance. 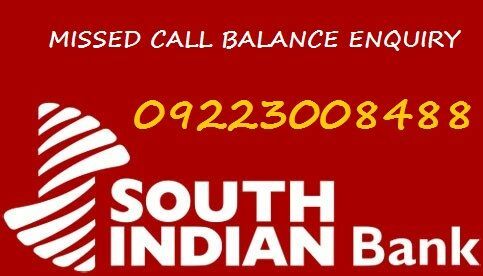 To provide updated account balance information the South Indian Bank has introduced a missed call service called the "SIB Missed Call Service". To take the advantage of this service you have bear no call cost. Just give a missed call to 09223008488 from your bank registered mobile phone and get account information within a few minutes. To know your account balance send SMS under the format "BALXXXX" and send it from your mobile number to 09840777222.To know mini statement, send sms 'TRNXXXX' to the same number 09840777222. Note: Initially XXXX is last four digits of primary account number If you do not have any PIN contact with the bank personally and collect the PIN. This is one of the popular methods comes from the bank. You can easily check your account balance if you have 'Internet Banking Login Pass'. Go to the bank's official site and apply this facility. The other methods you can opt for are the use of Bank mobile app or visit directly to the bank and take a hard copy of your account balance. sir, when I tried to know the account balance trough miss call alert number, says the phone is switched off, .noresults, when tried in SMS number also, how can I know my account balance. Sir, I don't have the mobile number linked to my account with me right now. How can I add another number to my account? Sir, my father just put cash in my account before 1 hour but it still not came in my account. Sir, I forget south Indian bank account number please send my account number today. thank you. sir, check your account number in passbook. How we can we provide you account number.